In recent weeks, we’ve heard news of riots and strikes at some Foxconn plants in China that are making Apple products. Earlier in the year, the New York Times ran a massive feature story detailing working conditions at Foxconn, which left readers with the impression that Foxconn’s plants, while not exactly “sweat shops,” reflect the vast and often troubling differences in workplace standards between China and the U.S. While Foxconn workers did reasonably well compared to their peers, they endured brutal hours and dismal living conditions to achieve it. The situation initially made news in the West after a string of suicides at the plants; the unrest at the end of September put Foxconn back in the news cycle – with one major difference. This time around, coverage was as likely to be about how the riots were effecting Apple’s delivery of the iPhone 5 as it was to be about conditions in the factories. According to a survey by Hunch.com, the typical Apple consumer is a little more affluent than average. They tend to be college educated (67%) and lean more to the left of center politically (58% characterize themselves as liberal). In other words, the kind of people that – if you’ll pardon the generalization – would seem to concern themselves with the working conditions in second and third-world countries. Apple’s situation with Foxconn brings to mind another large U.S. corporation facing wide-spread criticism brought on by its manufacturing partners: Nike in the 1990s. That scandal erupted after the sneaker and sportswear giant’s growth caused them to rapidly expand their overseas production. It, too, received widespread coverage in the press, including a 60 Minutes feature and cover stories on many of the top news magazines of the day. To date, Apple’s issues with Foxconn haven’t received coverage either of the scale or the intensity that Nike dealt with at the height of the sweatshop scandal. To be fair, there are important differences between the two. The conditions described at the Nike factories 20 years ago were considerably worse, even by Foxconn’s unpleasant standards. And Apple clearly learned some important lessons from how Nike executive dealt with their issues in the media. It took several years for Nike to present a united front in the face of criticism, where there was originally equivocation and aloofness. More damaging was the company’s repeated insistence that, since the factories in question weren’t owned by Nike, Nike bore no real responsibility for the conditions there. 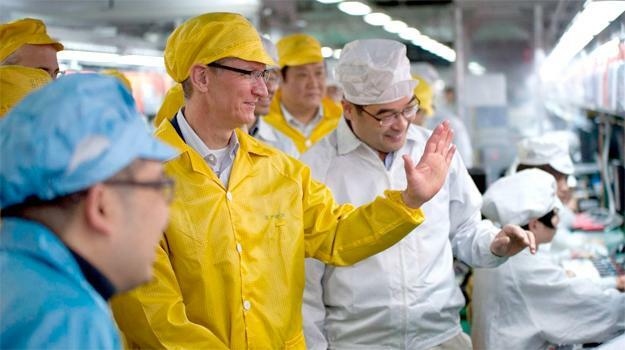 Apple has been far more proactive in investigating working conditions at Foxconn and making demands of its most important production partner. Nevertheless, the events of last month prove that there’s far more to be done. The differences between the two scandals don’t end with the companies, however. We as consumers seem to have changed since the 90s, and not necessarily for the better. There’s a greater understanding these days that the goods we rely so heavily on are produced in – and often at the expense of – people in the developing world. Of course, this happens at our own expense as well, when you consider that the U.S. has lost 28-percent of it high-tech manufacturing jobs in the last decade. And it seems we’ve made our peace that, because we’re unwilling to effect change with the most powerful tool available to all of us: our wallets. Between 1994 and 1998 – arguably the height of the Nike sweatshop scandal – the company’s sales went from $3.8 billion to $9.6 billion. And Apple? Potential disruptions to the iPhone 5 supply chain notwithstanding, the most valuable company in history grows larger by the day.